Editor’s note: This is the second installment in a two-part, immersive story on Pitt’s Rugby Football Club. With helmets, it could have been a scene from a war movie — weary warriors waiting to charge into battle. But there were no helmets. This was not war. This was not even football. It was rugby. 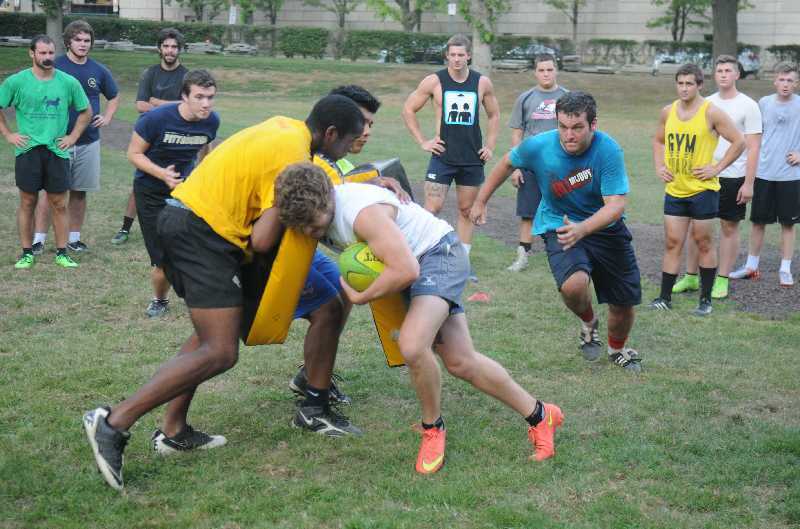 Thirty minutes into a rugby practice with the University of Pittsburgh Rugby Football Club, I was discovering whether or not I could succeed at this foreign sport with no experience whatsoever. Across from me was Aidan Nuttall, Pitt rugby’s president. Exhausted as I was, I felt somewhat better that the senior, who has been playing rugby since his first semester at Pitt, looked worn as well. Nuttall has been involved in Pitt’s rugby team since his freshman year. Nuttall played high school football but found that rugby let him get engaged in the action. “I got to touch the ball more, it’s definitely something that kept me around, the ability to be so involved,” he said. The drill we ran certainly kept us engaged. Coaches Allan Murray and Derek Neubauer devised the exercise to help teach the team to quickly adapt to a change in possession. They had noticed transitions as an issue in their last game, a 50-19 win over Indiana University of Pennsylvania. The coaches had divided those in attendance — around 35 people — into three groups. One group played offense, one defense, while the odd group out jogged around their teammates. I started in the offensive group. At Neubauer’s whistle, we ran to the announced color-coded cone and tried to prepare an offensive attack. As we waited for the whistle, I asked Nuttall what I should do. “Oh, you’re with my group? Stay toward the side and watch, you’ll pick it up,” he said. I did as told. At the whistle, we fanned out, while I kept myself toward the right. The defense, lying face down on the ground behind the cones, had to jump up from that position and set up an effective counter. Then, a veteran on the offensive side ran up and tossed the ball back to the offense. “Back” is the most important term in rugby. All passes must be backward, unlike the bastardized American version of the sport. Upon viewing a game during a visit to America, Winston Churchill remarked the biggest difference between football and rugby was “all the committee meetings” — the huddles. But the other difference, no matter how small, still took some getting used to. At multiple points, my instincts kicked in, and upon receiving the ball in a drill — when I actually managed to corral the ball, that is — I tossed it forward to an open player. At that moment, it seemed as if all practice ground to a halt, the team shocked at the indemnity of what had occurred. “A forward pass? What is this most foul creation? What rugby player would do such a thing?” they all seemed to think. Then, with a jolt, practice resumed, as they all remembered it was the journalist in their midst who had made the mistake. Luckily for me, the team doesn’t have huge expectations for the rookies, according to Murray. “As a freshman rookie, you can anticipate playing B-side consistently, until your sophomore year,” he said. As a sophomore, players usually have accrued enough experience to at least substitute in on A-side. After the attempts at offense, my group switched to defense. It was here, belly against the ground, grimace on my face, that I started to realize the extent of my exhaustion. My inner monologue began to question this journalistic endeavour . But then I remembered that nearly every person’s story began with them knowing nothing about rugby. I may not have been as strong as “Big Dave,” or as experienced as Aidan, but everyone started like this — nervous and exhausted. And everyone seemed to have the same grimace on their face that I had. So unbounded, we leapt up from our prone position at every whistle and rushed to form a line to hold off the coming assault. At this point in practice, there was no contact. I both hungered and feared for it. Getting hit by these large, well-practiced players did not seem like a fun proposition. But as I proved myself incompetent in ball handling and most other parts of the game, it felt like the one place I could still prove myself. Earlier on, Murray had gone over the proper tackling form for rugby. The most important part of a rugby tackle is going “cheek to cheek,” as he said — your face to the opponent’s buttocks. With no helmets or padding, taking a knee to the face would make it quite unappealing. But after my first attempt, when I had succeeded in going cheek to cheek, Murray noticed another remnant of the American game in my technique. The runs are led by the two captains, “Big” Dave Zimmerman, a senior chemical engineering major, who manages the forwards, and Connor Janawitz, a senior chemistry major, who manages the backs. The runs can involve stairs, hills, sprints, burpees — when you throw yourself to the ground and get back up — or anything else the captains decide to do. While few look forward to the cardiovascular exertion, the results the workouts produce quiet any dissent. “Everybody wants to win, generally when we have a winning season, everybody wants to run and win more games,” Zimmerman said. Jogging around the spectacle of practice gave all the players — myself included — a little extra conditioning. Everyone was filthy and sweating, but seemed to be enjoying themselves. Zimmerman knows the reasons for playing are as varied as the body types of the players. “Everybody has their own reasons, and everybody embraces that,” Zimmerman said. He then listed off friendship and the joy of a contact sport as additional points. Murray finds camaraderie the biggest draw. “It’s a very social sport,” the coach said. That seemed odd to me. Isn’t every sport social? I guessed it was a lesson I would need more time to learn. Finally, after many drills that involved passing and catching and rugby tactics — what I was worst at — we moved on. Next was what I most anticipated with both dread and excitement — some contact. It was time for the pads. We formed groups of four to practice a ruck — when the ball is transferred from a downed player to his own team. The first player hit a veteran holding a pad — playing a defender — and went down. The second player pushed away the defender, the third defended against a counter ruck and the fourth backed up. After some instructions on proper rugby hitting — lead with the opposite shoulder of the ball, stay low and wrap your arm without the ball around the opponent — I felt confident. But perhaps I felt too confident. On my try as the third man, I lunged over the downed teammate. In my absent-mindedness, I forgot to look up. Wham — like a ton of bricks, Murray hit me with the pad. I had tried to mentally prepare myself for this situation, the chance to prove myself as tough enough for this rough-and-tumble sport. It was the moment I both feared and wanted. And I did not give an inch. OK, that’s an exaggeration. My head spun for a moment. I almost stepped back onto the head of the man I was supposed to be protecting. “Not bad,” Murray said. For the first time that evening, I was proud of myself. As the coaches and captain brought our tired selves into the huddle, I saw why rugby specifically is such a social sport. “You are fighting and scrapping and playing with these guys, so you build a bond,” Murray said. It’s a bond enforced by a desire to stretch your legs, take a couple of hits and get dirty. The team put their hands in. “Who are we?” Zimmerman shouted. “Pitt rugby!” the team roared. I may have been an amateur. But I don’t think anyone else cared. We all were.